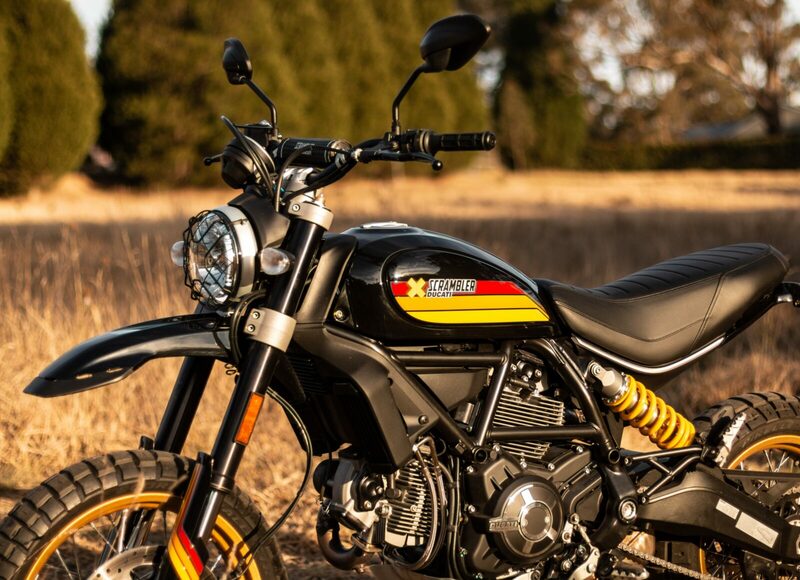 The biggest surprise during my week on the Ducati Scrambler Desert Sled was just how much attention it got – people would cross the street to talk to me when I parked it, and gas station visits would always result in at least one but usually two or more people coming over for a chat. 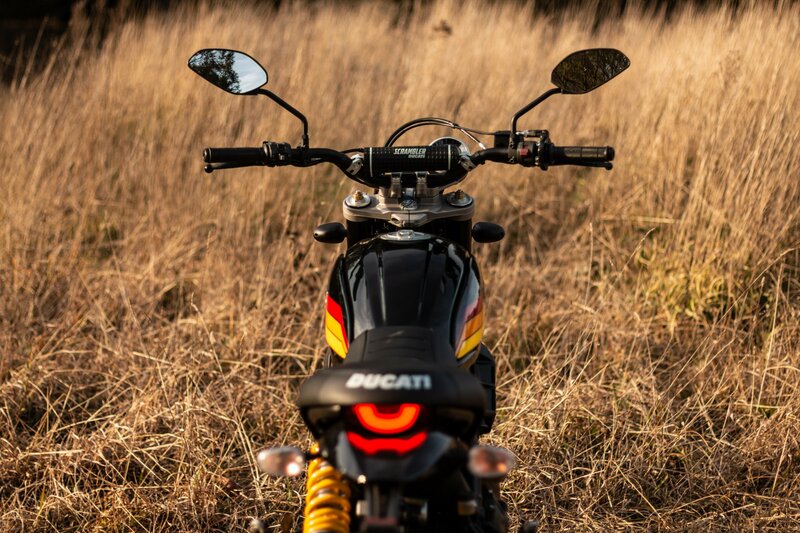 My favorite encounter of the week was an elderly gentleman who wandered over and pointed at the bike before asking “What year is it?”, I said “2018” he angrily replied “No I meant what year is the f@#king bike!” After we cleared up that it was in fact a 2018 Ducati Scrambler and that I wasn’t implying he was senile he calmed down a little and we had a good chuckle about it. 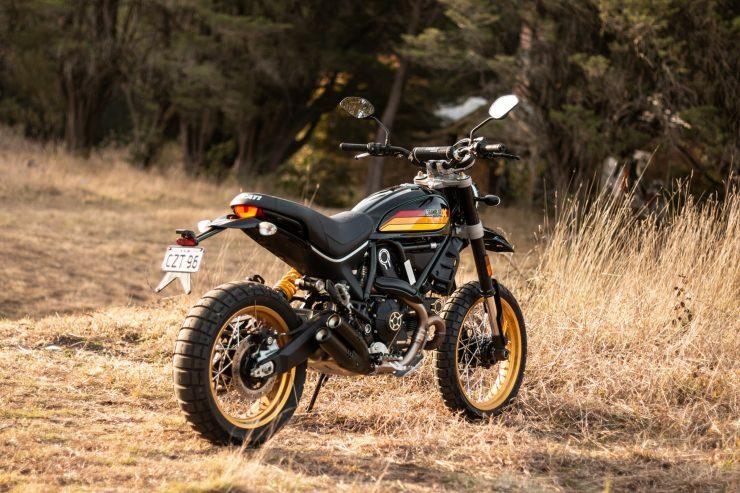 The scrambler genre is currently white-hot, and if you expand the category to include street trackers it’s a market segment that many of the biggest names in the motorcycle world are pouring millions of dollars into, developing new models, or as is the case with Ducati, entirely new sub-brands. 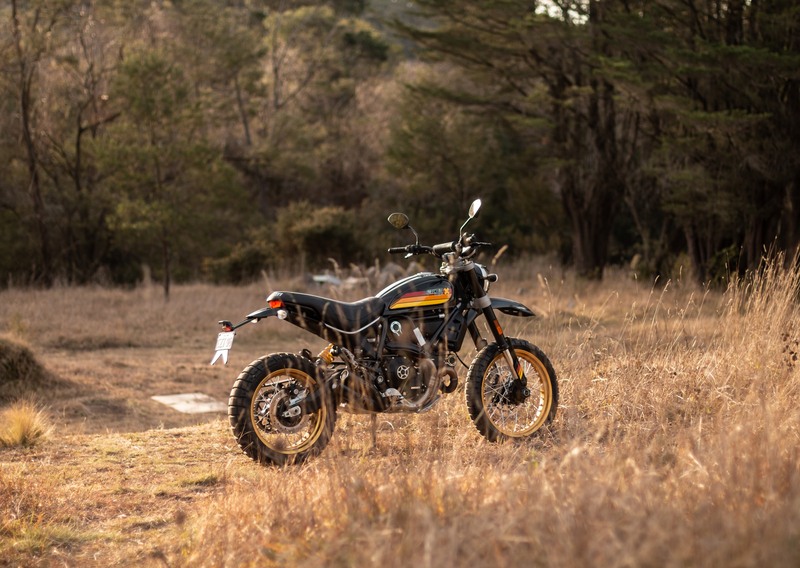 The allure of the scrambler is simple to understand, these are classically styled motorcycles designed for commuters who want to ride them to work Monday through Friday, then spend their weekends adventuring down forest trails, across abandoned beaches, and out into the great wide open. Dual sport riders often turn their noses up at scramblers, but it was the scrambler riders of the 1950s and ’60s that created the niche in the first place, so contemporary scramblers have a well-deserved place in the modern motorcycle world. 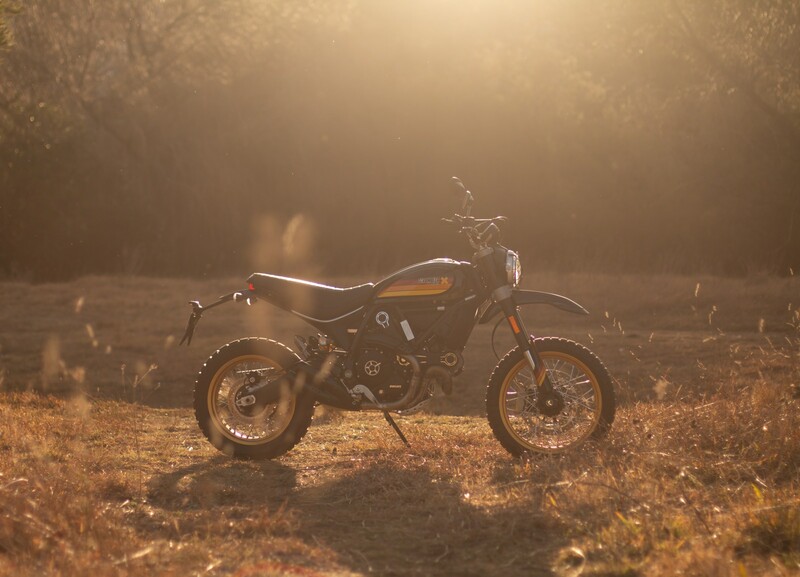 The Ducati Scrambler was first introduced in 2014 with sales starting a year later in 2015. 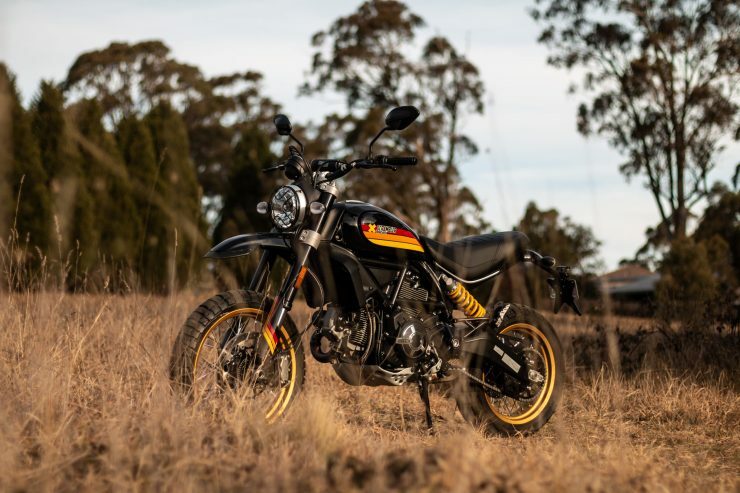 The styling of the series is loosely based on the Ducati Scramblers that were built from 1962 into the 1970s, and many of the design cues of the earlier Scramblers have been integrated into the new models. 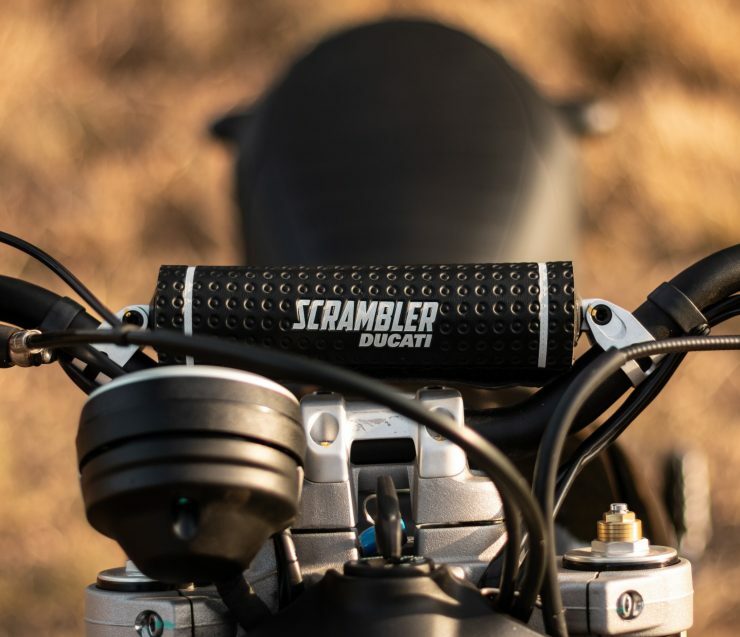 The core of each of the Scrambler models from Ducati is an air-cooled, desmodromic L-twin engine in capacities ranging from 400cc, to 800cc, to the newer 1100cc. The Desert Sled is one of the 800cc variants and long story short, it’s the model you choose if you’re genuinely planning to go off-road. 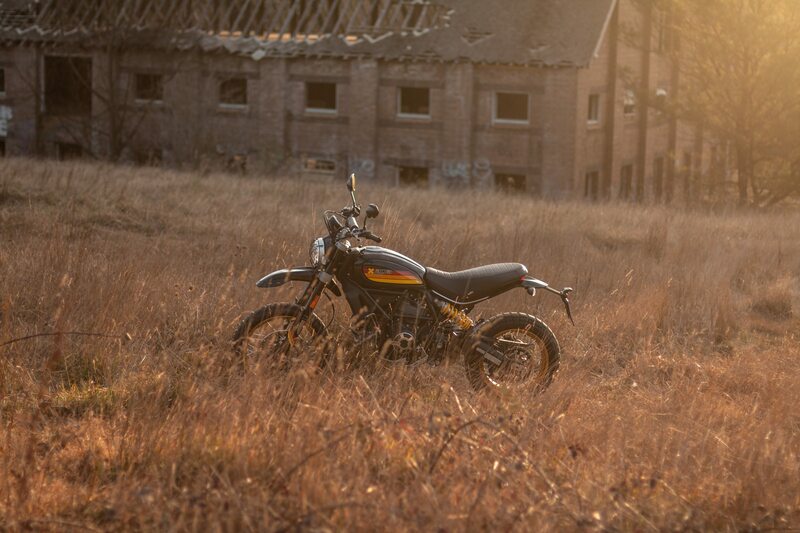 The Desert Sled is the cornerstone of the current line of 800cc Ducati Scrambler, this is the bike that the designers at Ducati wanted to build from day one – with genuine off-road capability, proper dual sport suspension front and back, a bash plate under the engine, radial four-pot Brembo brakes in front and a smaller Brembo on the rear. Although the Desert Sled looks like a normal Ducati Scrambler that’s been given more ground clearance and a styling package, the changes run far deeper – there are new reinforcements on the lateral edges of the frame, and new side-plate reinforcement at the junction of the swing arm pivot point, frame, and engine. 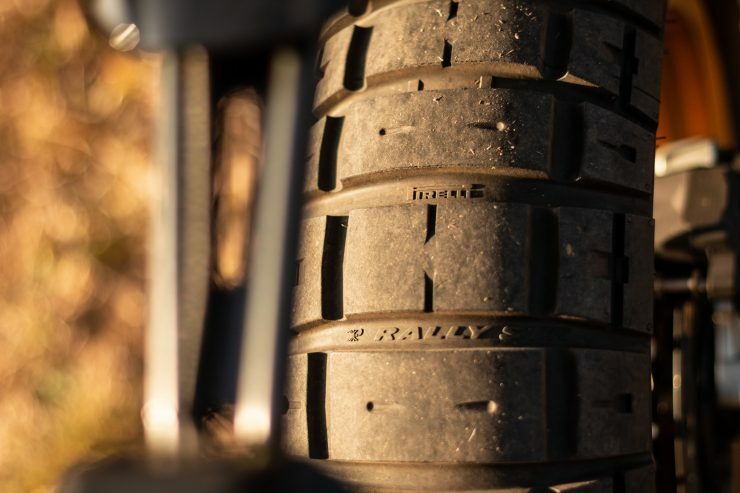 From an engineering perspective these are notable changes, designed to significantly toughen the bike for genuine off-road riding – and maybe even the occasional brief foray into the air. 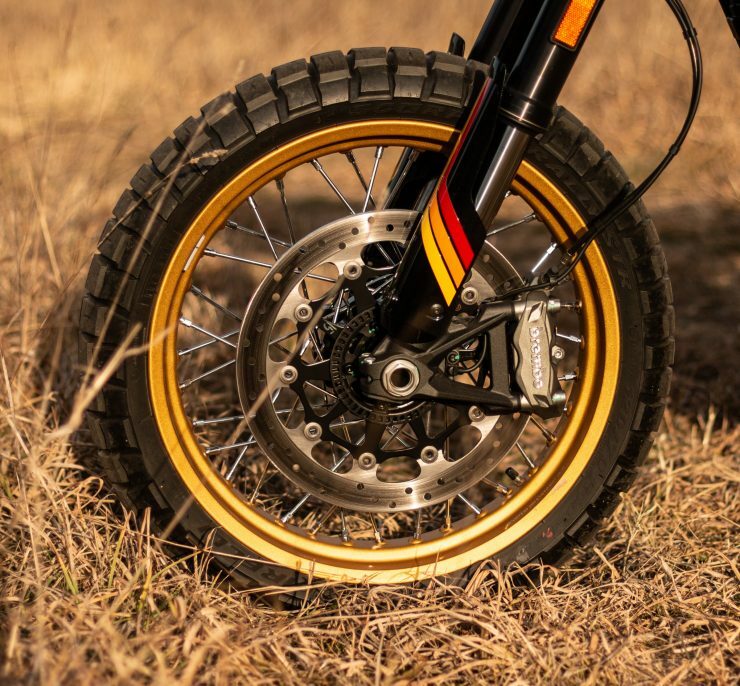 Although we don’t have a dyno chart handy my trusty seat-of-the-pants-dyno made it clear that the torque curve is relatively flat above 3500 – 4000 rpm. So long as you learn to keep revs in this range when you’re off-road, you’ll always have a fistful of power at the ready when you need it. 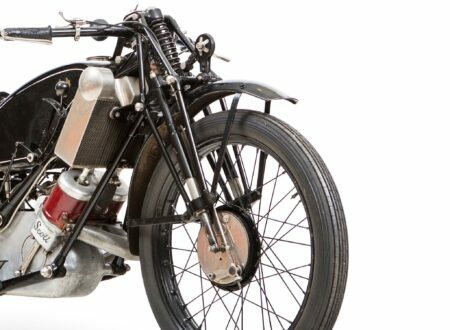 The Ducati L-twin (don’t call it a V-twin or you’ll wake up next to a dismembered horse head courtesy of the Ducatisti) is one of the most iconic engines in the world of motorcycles. 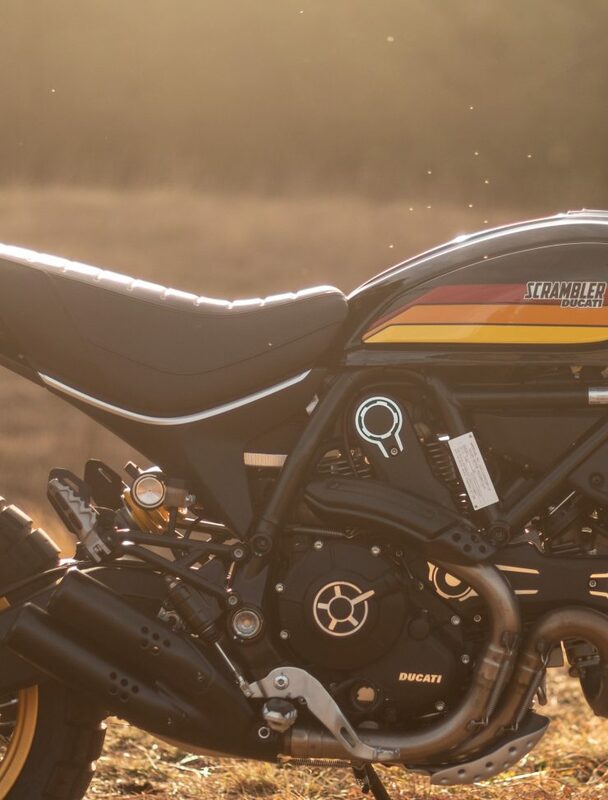 A Ducati L-twin with desmodromic valve actuation, air-cooling, and a trellis frame is a borderline sacred object to many, and a week with the Desert Sled is a good reminder of why. Throwing a leg over the Desert Sled was my first indication that this is a bike intended for more than just road riding, the seat height is 860 mm which compares similarly to the 850+ mm seat height of the BMW F 1200 GS & F 800 GS. I have a 32 inch inseam and I could plant both my feet flat on the ground while on the bike, but there wasn’t much additional room to move. 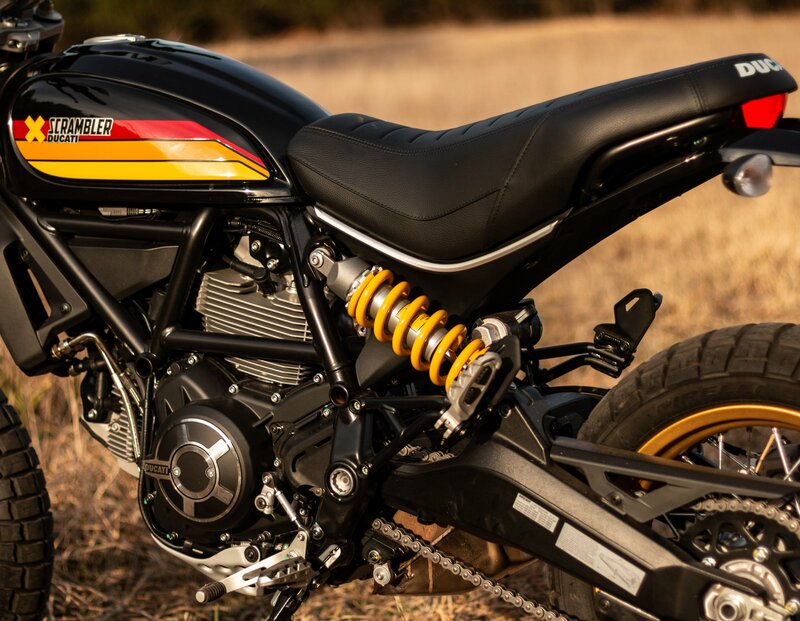 Clicking the bike into first gear and heading off I was surprised by how quiet it was, my previous encounters with Ducatis have largely been with the modified-exhaust sausage creature superbike variety and their rambunctious exhaust note – so the Desert Sled was remarkably tame by comparison. 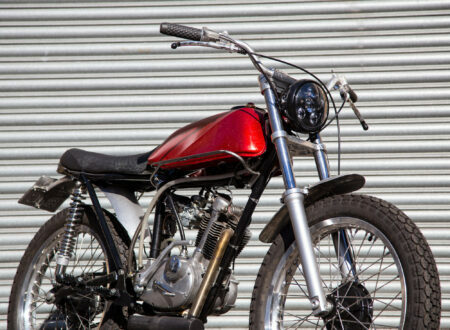 The six-speed gearbox snicks through the gears cleanly and with no fuss, I did struggle to find neutral though this was likely due the hefty motocross boots I’d chosen to wear on my size 13 feet, many a red light saw me clicking from first to second and back while muttering animatedly into my helmet. Urban riding makes up half the design brief for this bike, and it does it well, the additional seat height is a blessing in traffic as you can see over the top of many of the vehicles in front of you. 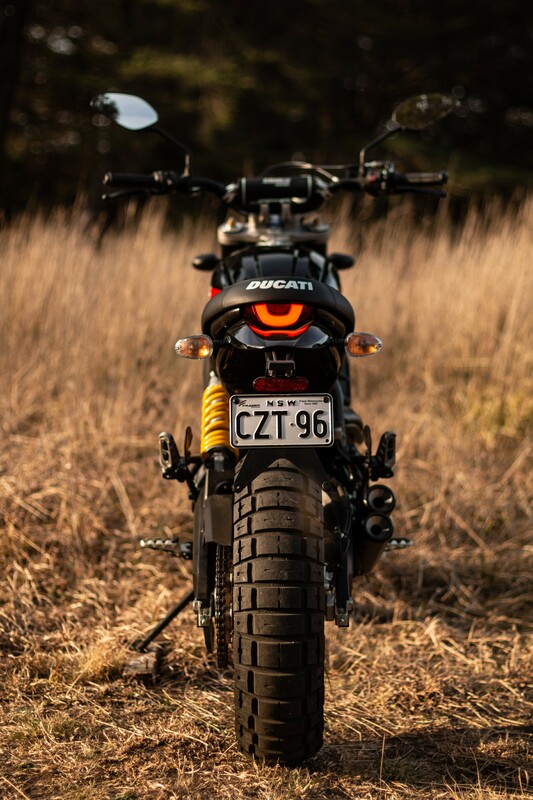 For slow moving traffic you can leave it in second gear and largely forget about it, lane-splitting wasn’t an issue even with the slightly wider handlebars. 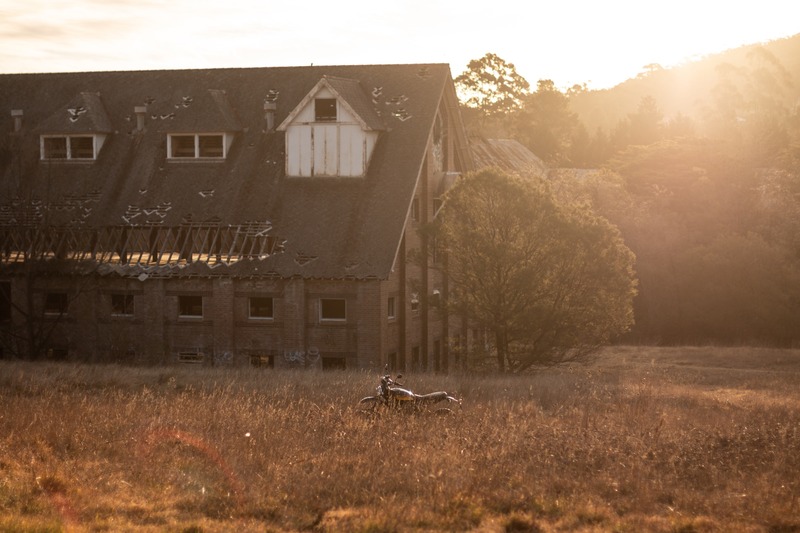 At the suggestion of a friend I took the bike an hour and a half south of Sydney to the abandoned Tooth & Co. Brewery in Mittagong, it’s a few acres of undulating land with a series of abandoned buildings and a wide variety of terrain ranging from rough grassy fields, to dirt tracks, to exceedingly lumpy rocky sections. 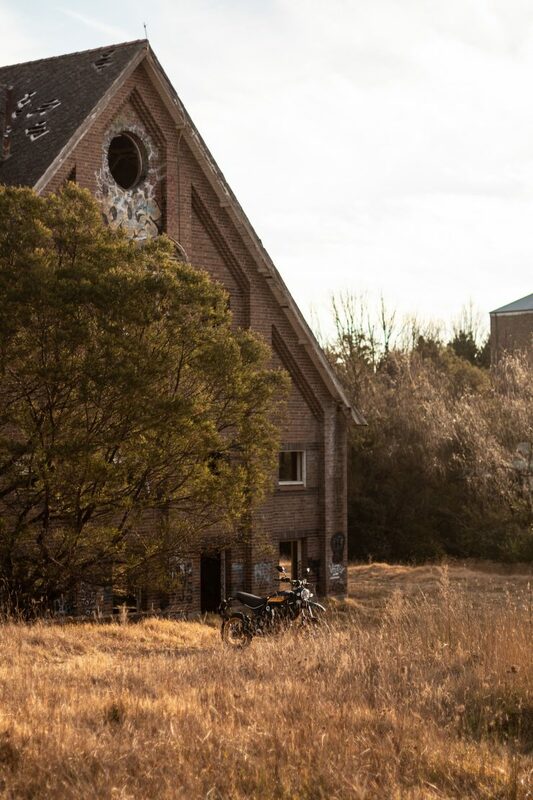 I spent two days at the site riding both inside the abandoned building (unless that’s illegal in which case I didn’t) and out in the wild. 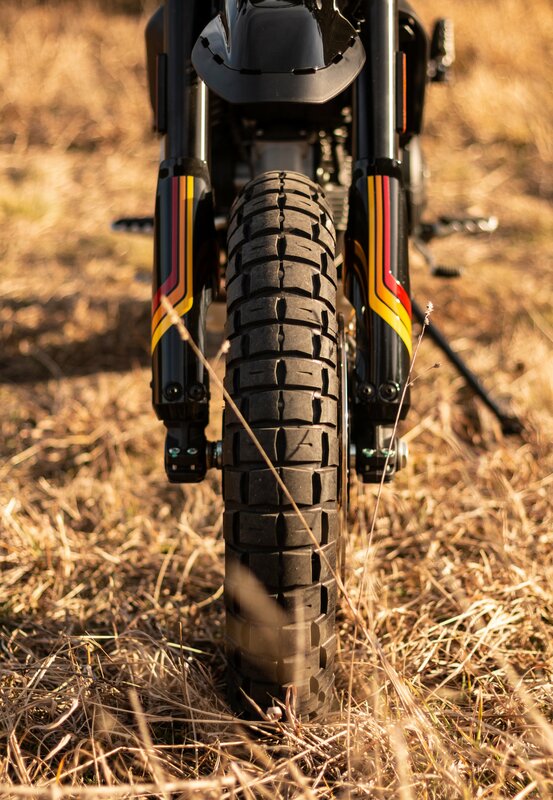 Without being overly effusive, the Desert Sled surprised me with its off-road ability. Perhaps this is because I’ve ridden many modern scramblers and I wasn’t expecting much, but this bike quickly rose in my estimation from “light off-road riding only” to “let’s see what else it’ll do”. 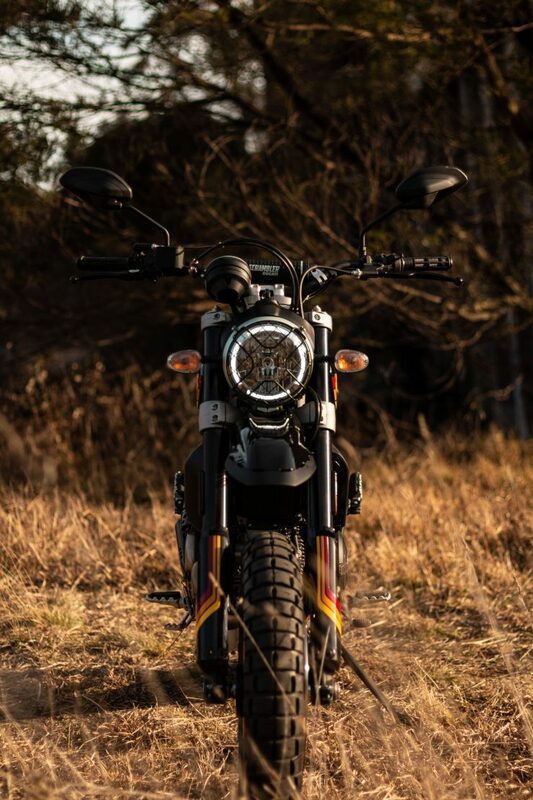 After a couple of hours of looping the grounds and changing from grass to gravel to rocks and back again, with significant elevation changes, and countless will-it-or-won’t-it moments wondering if the bash plate is going to take a hit (it never did), I was left thoroughly impressed with the Desert Sled. 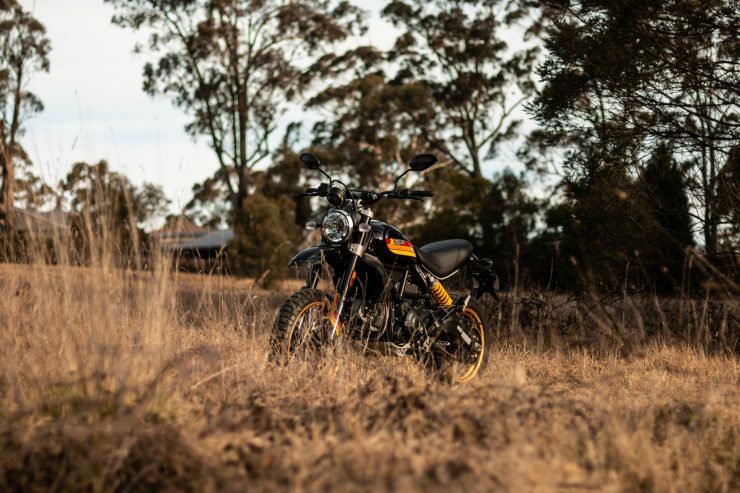 After I begrudgingly handed the keys back I read some other reviews to make sure I wasn’t misguided with my take on the off-road capabilities of the bike. 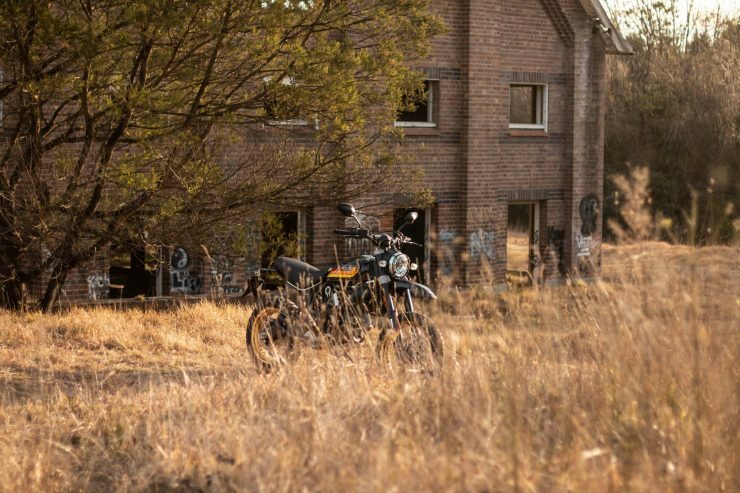 The consensus among the major motorcycle magazines seemed consistent – I wasn’t the only one who was taken aback with the bike’s off-road chops. 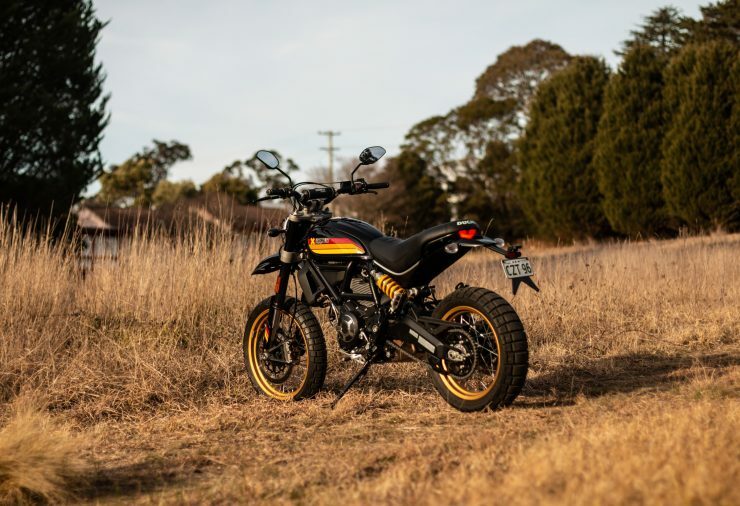 The Desert Sled is obviously not a Husqvarna or a KTM – it’s not a modern enduro bike or a motocross two-stroke, what it is is a legitimate dual sport bike with classic styling cues that’ll do an admirable job of keeping up with the guys riding a BMW GS or a Triumph Tiger. 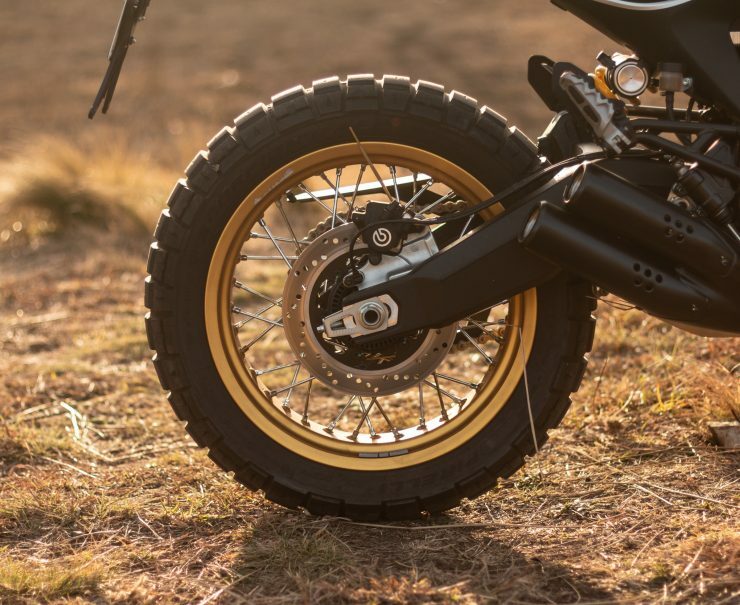 That said, the Ducati does have slightly less suspension travel (7.9 inches front and back) than either the F 800 GS (9.1 inches front, 8.5 inches rear) or the Triumph Tiger 800 (8.6 inches front, 8.5 inches rear). Realistically it’s not likely that a GS or Tiger buyer would be a potential Desert Sled buyer (and vice versa), but these bikes will encounter each other on trails, and the Scrambler will keep up 80+% of the time. 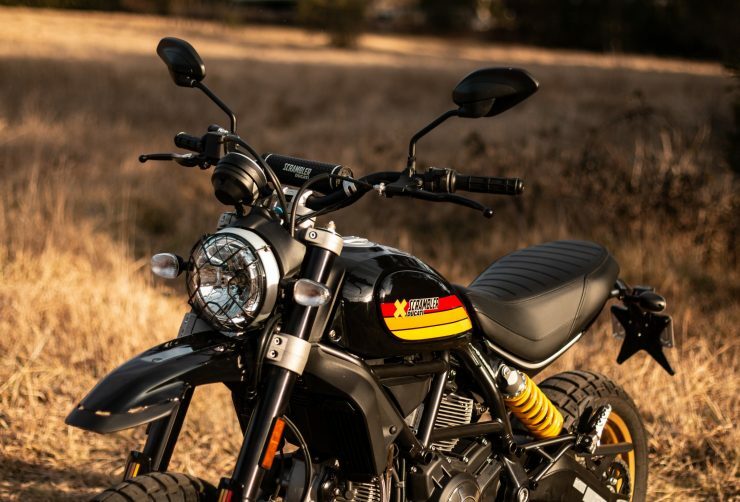 The major competition for the Ducati Scrambler Desert Sled is the Triumph Street Scrambler and the BMW R nineT Scrambler, both of these are good capable bikes, but they both feel like they’re a generation behind the Desert Sled. 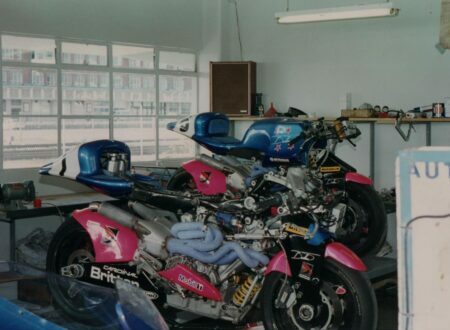 If you have the time go to the three dealerships and ride each of the three bikes – you’ll see what I mean. 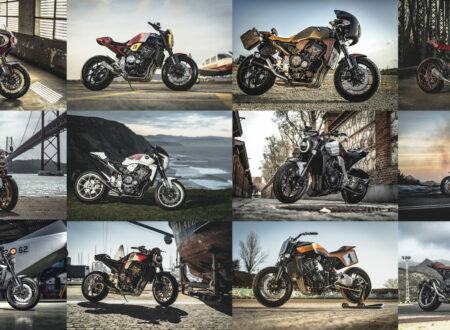 The strange thing is that Triumph and BMW have large and highly capable departments dedicated to adventure bikes, whereas Ducati doesn’t really. 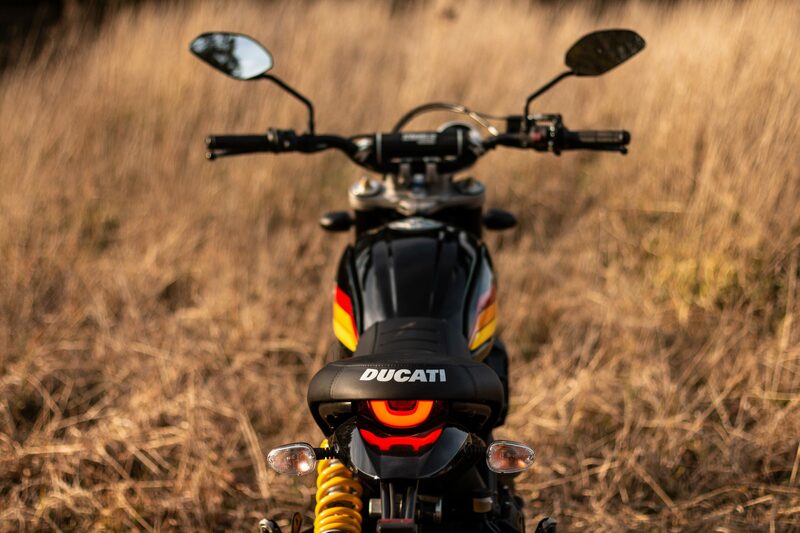 The Italian company does have the Multistrada Pro but it’s basically a ruggedized version of the Mulistrada, not a bike that was engineered from scratch for Sahara crossings. We’re hoping that the Desert Sled will push the entire market segment forward to where it should be – a genre of genuinely capable dual sport bikes with classic styling and a simple, reliable drive train. 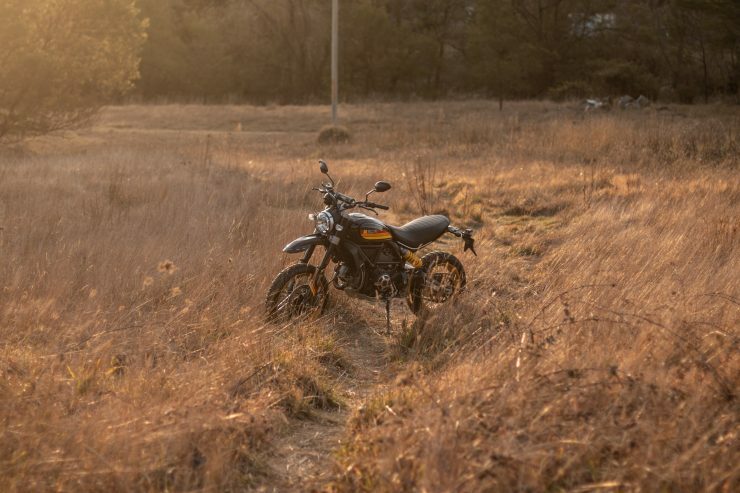 There’s no reason that scramblers shouldn’t be off-road, riding shoulder to shoulder with modern adventure and dual sport bikes – in fact, that’s exactly where they belong. – Everyone wants to come and talk to you (this is a pro if you’re an extrovert). – The design will never go out of style. 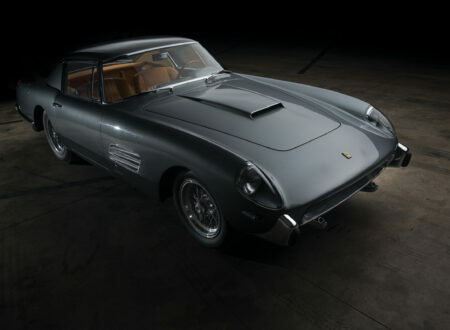 – Likely to retain resale value well. 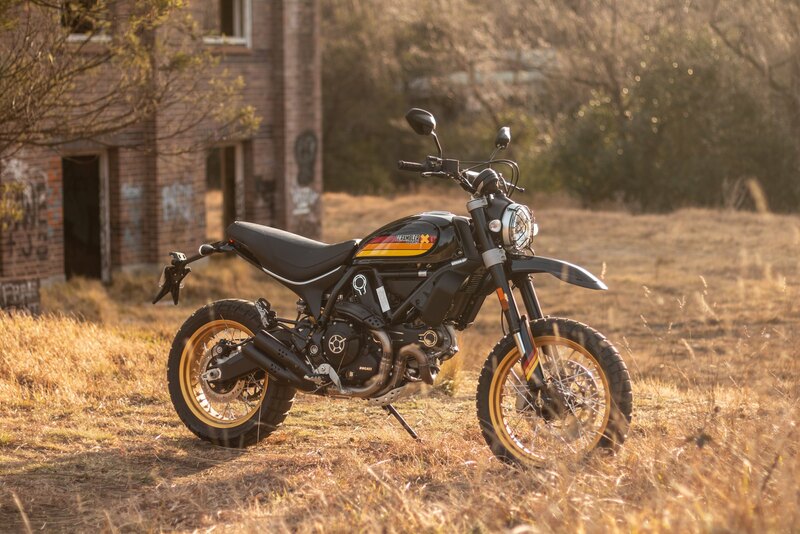 – It’s the most off-road capable scrambler currently on sale, hands-down. – Everyone wants to come and talk to you (this is a con if you’re an introvert). 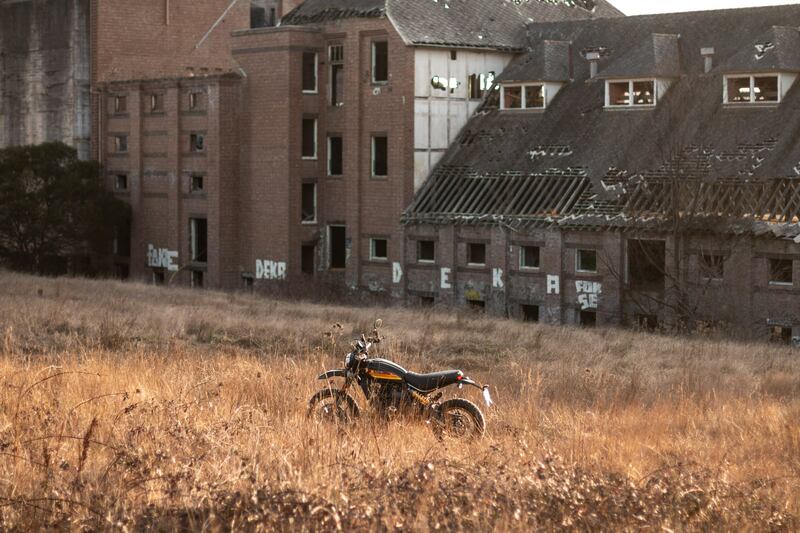 – Seat isn’t suitable for long rides (aftermarket units are available). 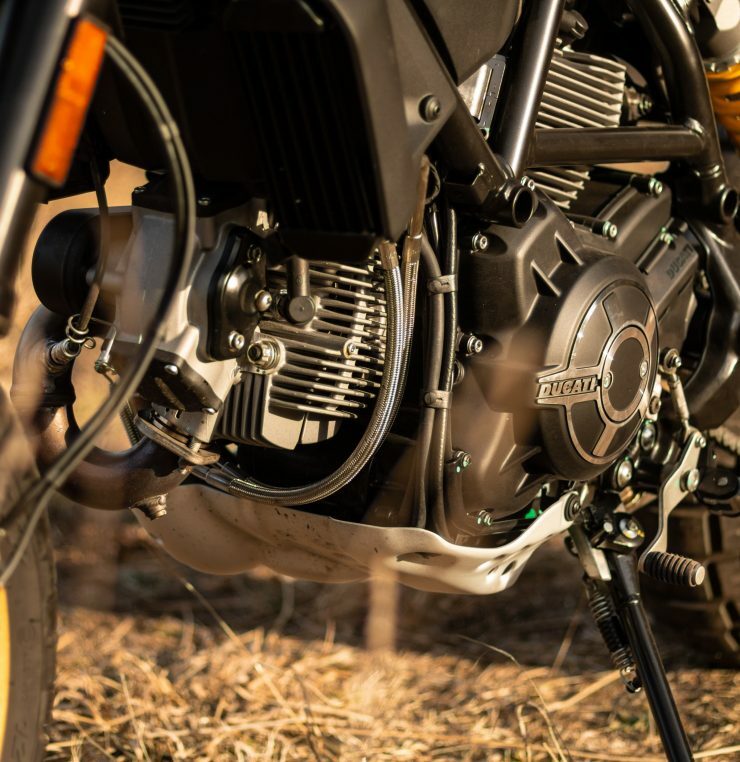 – Exhaust will be a little quiet for some (aftermarket units are available). 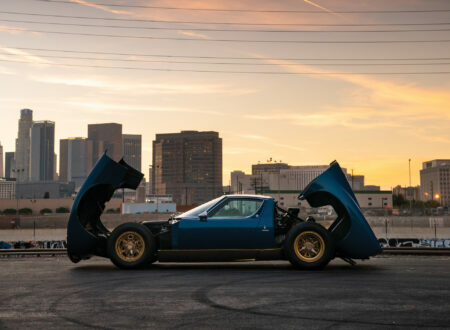 Photography: Ben Branch ©2018 for Silodrome.com – Images may only be republished with credit and a link to this article.